Our menu is fun, fresh and full of flavour. We are proud foodies and believe that there is nothing better than bringing people together to eat delicious food. We handpick our favourite recipes from around the world and perfect them in our kitchen. From our homemade marshmallows on top of our chocolate fudge hot chocolates, to our free range chicken schnitzels that are hand beaten & freshly crumbed, to our hand minced, mouth watering beef burger patties, to our famous mars bar cheesecake swirled through our made to order thickshakes - we love the food we make. What we don’t make ourselves we make up for by using Sydney’s top suppliers. We proudly work with Five Senses Coffee, who provide us with their Dark Horse blend & intensive barista training - thanks Geoff. The Vege Box supplies us with amazing sustainably grown, locally sourced fruit & veg - thanks Shane & Amanda. Haverick Meats supplies us with top notch locally sourced free to roam & hormone free chicken, RSPCA approved pork, and tender grain & grass fed beef & lamb. Our free range eggs are delivered fresh from Lake Macquarie Farms and our organic & preservative free burger buns and sourdough is delivered daily from St Malo’s Organic bakery. Micky’s has been at the heart & soul of Oxford St for 30 years. We have watched Paddington grow up into the sophisticated & charming suburb it is today and we feel that we’ve nourished it’s growth along the way with our love of providing great food and good times to all who walk through our doors. Locally owned and operated since 1988, Owner Helen has crafted Micky’s into the much loved venue it is today through her research & passion for fine food and dining in Sydney. Growing up in the small rural town of Stanthorpe, Helen’s food philosophy has been greatly influenced by the amazing produce she grew up on and the generosity & flavours of her family’s Greek heritage. Memories of picking plump ripe tomatoes straight from the vine, her mothers homemade blackberry pies and her fathers famous burger patties are the back bone of what makes Micky’s so special. We are open 11am til midnight Monday - Friday & 9am til midnight weekends. We are fully licensed with a seasonal alcohol menu that offers craft beers, wine, cider and artisanal cocktails. Breakfast is served until 5pm daily and we have great value meal deals available to our dine in customers. You can enjoy Micky’s dine in, take away or home delivered. 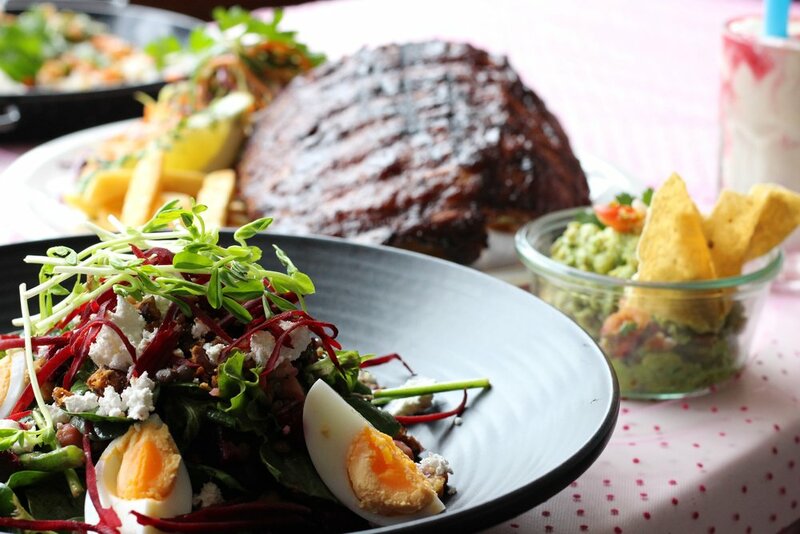 Find us at 268 Oxford St, nestled amongst boutique fashion stores, cinemas, galleries and a stones throw from the Sydney Cricket Ground - making us the perfect spot for your pre or post game feast. Step through our red doors and inside you will find cosy booth seating, a large sunny courtyard, an elegant upper dining area with big bay windows that overlook Oxford St and an adjoining upper terrace with festoon lights. At Micky’s we like to think that we’re an important part of people’s lives. We’ve watched kids grow up & graduate from school, we’ve seen first dates lead into second dates, engagements, marriages and newborns and we’ve celebrated countless birthdays. Private party rooms are available for group bookings - ask us about having your next get together at Micky’s - we know how to throw a party. We have an awesome kids play area - complete with a kitchenette, cake stand, chalkboard, dolls house & loads of games to keep your little ones occupied while mum, dad or carers relax. We also have a great kids menu with heaps to choose from. We are a neighbourhood cafe with a big heart. We love our community and support many important causes including local schools, charity events, The McGrath Foundation & Cafesmart which raises money for the homeless. If you are a local school or community group that’s looking for support - get in touch! We source local, sustainable, free range and preservative free produce from a range of amazing suppliers & we make everything fresh to order, meaning we have very little food wastage. We also make everything in house (sauces, gravy, mayonnaise) - reducing packaging needs and food miles. We also make all our own stocks - meaning the whole animal/vegetable is used - which makes for a delicious flavour & reduces wastage. We use cotton cloth napkins that we wash, dry and fold on site to reduce paper wastage and the overuse of harsh chemicals & our staff aprons are made from organic cotton. Where possible we use recyclable & eco friendly materials for our food packaging and use paper straws for our drinks to reduce plastic waste. We recycle our wine bottles as water bottles and serve our sparkling water fresh from our Purezza premium filtration system - served in reusable carafes. We encourage customers to BYO their own re-usable coffee cup for takeaways by offering a 50cent discount. You can also purchase one of our Micky’s re-usable Keep Cups. We clean our wood floors with vinegar & bicarbonate soda to reduce the amount of dangerous chemicals down our drains. We use Sukin hand wash which is 100% vegan, cruelty free & carbon neutral. The foam boxes that our produce is delivered in & our milk bottles are returned to our suppliers for re-use. Our cooking oil is collected and recycled by ScanLines which transforms our used oil into valuable animal feed & fuel ingredients. We happily take bookings, we would love to have a table ready for your arrival. We highly recommend making a reservation if you are coming to a sporting or other event in the area. For bookings of 15 guests or more, please refer to our parties information. We’re located opposite from the Paddington Reservoir, and only a stones throw from the SCG. Dine in deals are available dine in only. The more information you can let us know - the better we can help with your request! Please let us know on which date you were wishing to hold the booking, approximately how many guests will be attending & what type of event you are celebrating.